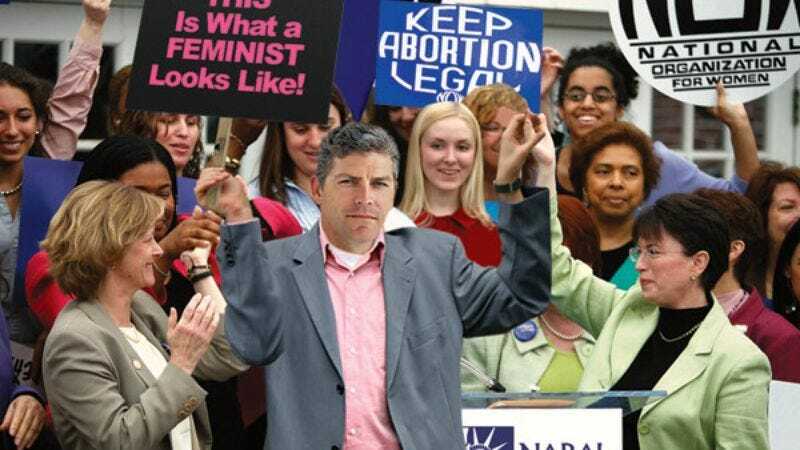 Head feminist "Buck" McGowan leads a march on Washington for women's rights. WASHINGTON—After decades spent battling gender discrimination and inequality in the workplace, the feminist movement underwent a high-level shake-up last month, when 53-year-old management consultant Peter "Buck" McGowan took over as new chief of the worldwide initiative for women's rights. McGowan, who now oversees the group's day-to-day operations, said he "couldn't be happier" to bring his ambition, experience, and no-nonsense attitude to his new role as the nation's top feminist. "All the feminist movement needed to do was bring on someone who had the balls to do something about this glass ceiling business," said McGowan, who quickly closed the 23.5 percent gender wage gap by "making a few calls to the big boys upstairs." "In the world of gender identity and empowered female sexuality, it's all about who you know." "It's about time," McGowan said upon returning from a golf game with several "network honchos" in which he brokered a deal to bring a variety of women's sports to prime-time television. "These ladies should have brought me on years ago." McGowan claimed that one of the main reasons the movement enjoyed so little success in the past was that the previous management was often too timid and passive and should have been much more results-focused. "You can't waste time pussyfooting around with protests and getting all emotional about a bunch of irrelevant details," McGowan said. "If you want to enjoy equal rights, you have to have a real man-to-man chat with the people in charge until you can hammer out some more equitable custody laws." "And don't get me started on how disorganized and scatterbrained their old fundraising methods were," McGowan added. "Let's just say the movement never really had a head for numbers." After McGowan successfully appointed three of his best men to lead Smith College's women's studies department and called in some favors to a number of powerful board chairmen to triple the number of female CEOs in Fortune 500 companies, analysts predicted that the feminist movement could achieve all of McGowan's goals by as early as 2009. "With a charismatic, self-assured guy like Pete pulling the strings, we might even see a female elected president one of these days," said Nathan Roth, an analyst at the Cato Institute. "Finally, the feminist movement has a face that commands respect." McGowan, however, said he didn't get into the business of women's rights for the praise. "What these women were able to accomplish with the little manpower they had is very impressive," McGowan said. "I just bring a certain something to the table—I'm not sure what—that gave us that extra little push into complete female independence. I guess it just comes naturally." But despite his modesty, McGowan continues to garner praise from those closest to the cause. "The whole movement just seems more legitimate with Buck in charge," leading feminist Gloria Steinem said at a gala dinner Friday. "His drive, focus, and determination are truly remarkable. Mr. McGowan is a man with a plan." Although he has not hinted at any future projects after all forms of gender discrimination are a thing of the past, McGowan has vehemently denied rumors that he will leave the feminist movement to head up the struggle for gay rights. "The wife would kill me if I took on any more hours," McGowan said. "I'm sure those fellows know how that goes."